Can Pets Get Head Lice From Kids? Can My Pet Catch Head Lice From My Kids (Or Vice Versa)? Dealing with head lice is something most school officials and some parents are familiar with. If your child has head lice, you may wonder if the family dog is at risk of catching them or if the kids caught the lice from the cat. A lice parasite infection is termed pediculosis, no matter what species of animal is affected by lice. Lice are species-specific, which means there are ​different species of lice for each animal species that they depend on. Human lice need human blood to survive; dog lice need dog blood and so on. Therefore, if your child comes home from school with a diagnosis of head lice, your dog, cat or other pets in the household are not at risk of catching the lice or hatching eggs. Conversely, while lice are not common in dogs and cats, the species of lice that live on dogs and cats are not able to live on humans. While not an immediate threat to health, human head lice is contagious and not an indicator of poor personal hygiene. If your child has been diagnosed with lice, please see your healthcare provider for treatment and methods for removing the eggs (nits) from the hair, scalp, bedding, and clothing. Both over-the-counter and prescription medications are available for treatment of lice infestations. Dogs and cats occasionally get lice, though lice are not commonly diagnosed parasites in household pets. They are most often found in animals that live in conditions without proper sanitation. Additional risk factors include poor nutrition and poor overall health. Senior dogs and very young dogs are most at risk of lice infestation. The two types of lice that affect dogs are Trichodectes canis and Linognathus setosus. Cats get only one type of lice: Felicola subrostrata. Other types of animals are susceptible to other species of lice, but each species of animal is only infected by its own special species of lice. If a stray louse from another species finds its way onto a dog, cat or person, it will not remain there. Pet lice fall into two categories: blood sucking and chewing. Chewing lice live on the dead skin of your pets. They cause irritation, which causes your pet to scratch. They can carry diseases and transmit tapeworms to your pets. The blood-sucking lice do just that—such blood. Pets with lice will scratch and bite a lot. If left untreated, lice can cause fur loss. If you suspect that your pet has lice or other ectoparasites, see your vet for a definitive diagnosis. Lice are much easier to treat than other parasites such as fleas, and your vet will be able to recommend the best-medicated shampoo, spray, or spot-on treatment for your pet to get rid of the lice. 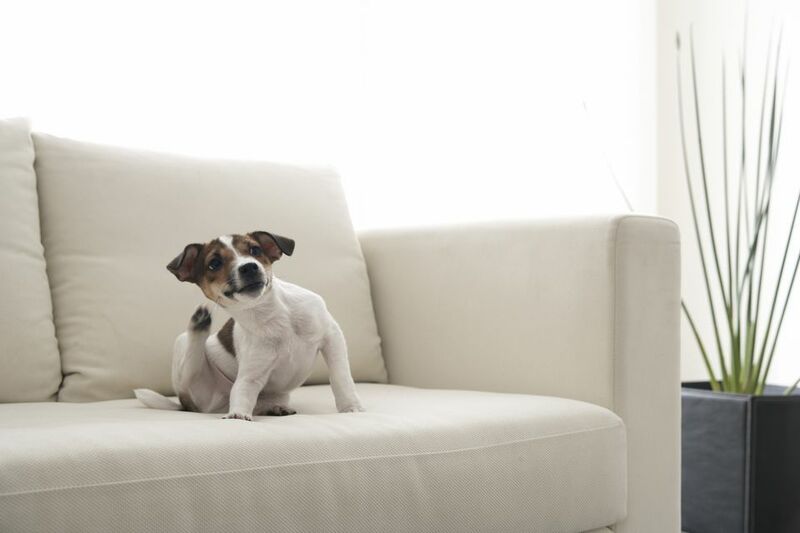 If your pet has lice, isolate the animal from other pets of the same species in your home to avoid the spread of lice. You'll probably need to treat your other pets out of caution anyway. Replace bedding, brushes, and combs used by the affected pet and clean rugs, and furniture where your dog sits.